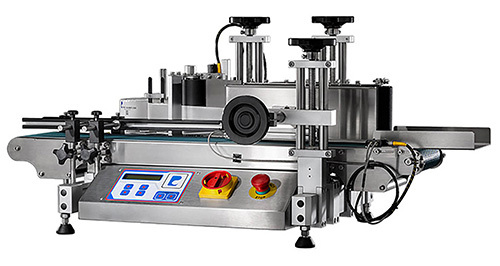 The ELF-50 is a portable wrap-around label applicator with the efficiency and mobility you need for your small production runs. In strict compliance with Good Manufacturing Practices (GMP) standards, the ELF-50 is made of 304 stainless steel and anodized aluminum, and carefully treated to guard against the effects of harsher environments. Additionally, its simplistic design enables quick fixes and easy adjustments. Given this durability and easy maintenance, the ELF-50 affords you a solid choice in labeling machine longevity. • The ELF-50’s standard one-button teach product and label sensors can be effortlessly adjusted for various labeling applications. And, with the manual position setting, your labels are placed accurately on the product, each and every time. • It’s easy to upgrade the ELF-50 to activate hot-foil printer controls. This integrated feature simplifies label customization and allows the hot-foil printer to work in sync with the labeler to ensure accurate code placement. • Thanks to the user-friendly operating interface, changing to different labeling applications for various product sizes and types can be done simply and quickly. • A production preset function means the machine automatically stops once the predetermined quantity of products has been labeled. • The label count feature lets you precisely track progress at any point during the production run. • The container/production run counter lets you see the exact production number for the day. • The ELF-50 features a battery-free microprocessor control system that maintains default settings and memory even after the machine sits idle for a long period of time. Up to five settings can be stored for future use, so you don’t have to waste time re-entering the necessary information. • The ELF-50’s stepper motor essentially counts the “steps” necessary to reach the next label, ensuring fast, accurate label delivery. • The ELF-50’s controls are fully synchronized, ensuring that all components run at the same speed. All Pack Leader USA labelers are manufactured in compliance with Good Manufacturing Practices (GMP) standards and meet the strict ISO 9001 quality control procedures. So, you can have confidence undergoing required quarterly inspections from industry compliance auditors.